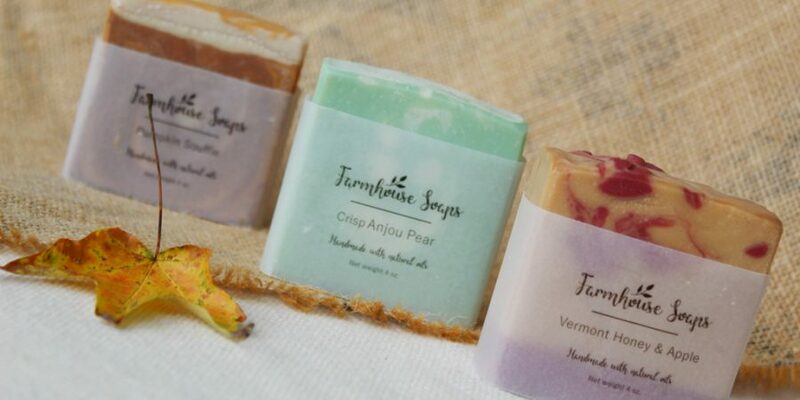 Today I would like to introduce you to Farmhouse Soaps: a line of handcrafted goods made in the kitchen of my friend Wendy Zook. Wendy was introduced to soapmaking two or three years ago. 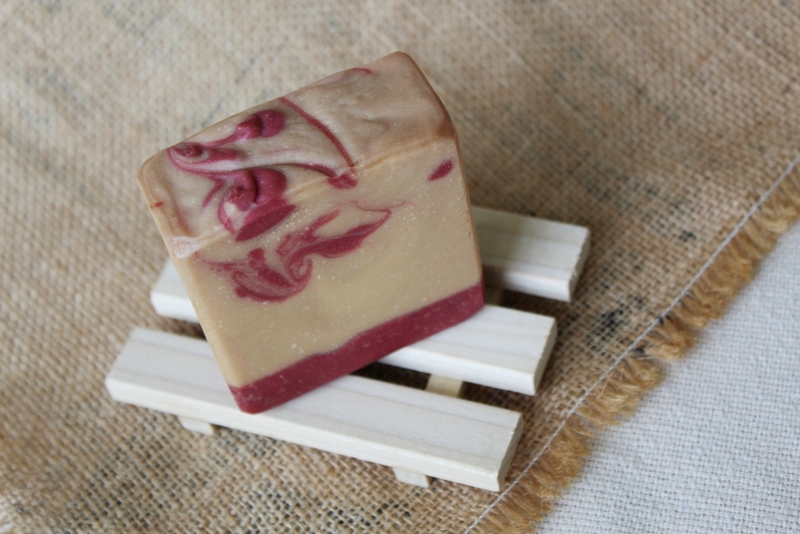 About a year ago, she was asked to produce it for wholesale, and she started crafting soap in earnest. She made many batches, tweaking her recipes and discovering what oils she liked best. In January 2018, she made her first batches to sell. Her recipes are simple, mostly coconut, olive, and palm oils with fragrance oils for scent and micas for coloring. All are homemade in small batches, and hand-cut. 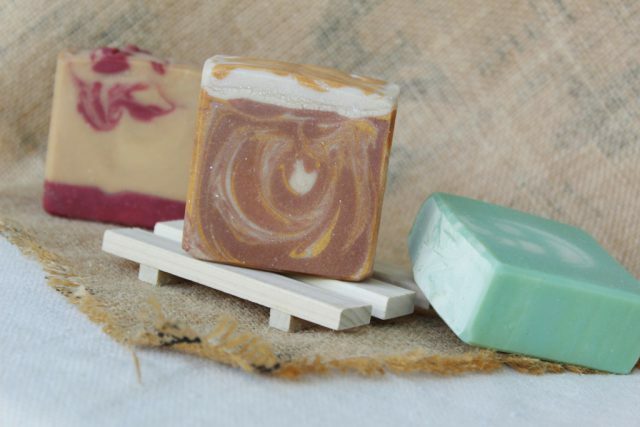 Farmhouse Soaps are hypoallergenic, easy on skin, and a pleasure to use as hand, facial, or body soap. They come packaged in pretty vellum wrappers. As a promotion, Farmhouse Soaps is offering a giveaway to Confessions readers. To one first-place winner, three bars of your choice. To a runner-up, two bars of choice. If Wendy is in love with making soap, her whole family is equally in love with sniffing and testing it – and I’m sure you can see why. The fragrances I’ve tried are heavenly! Of special note is the Charcoal Facial Bar, the one variety that Wendy tries to keep in stock always. I don’t have a photo of that one, but you can check it out here. She formulated and tweaked the recipe as her own. It’s available for $5.50 a bar. All the scents listed above are available now, in limited quantities. To place an order, contact Farmhouse Soaps through their Instagram account (@zooksfarmhousesoaps) or Facebook page (zookschalkdust). Or email the family at [email protected]. In case you’re curious, Wendy lives in Virginia with her husband and six children. She and I go back a long way, to our teenage years and a fast friendship that will last a lifetime. Her husband Travis and I go back even farther, to childhood days in Minnesota. I thought they showed such good sense in marrying each other. Plus I fell in love with Travis’s cousin, which makes Wendy and I kin of some sort. So about this giveaway: To enter to win two (2nd place) or three (1st place) bars of Farmhouse Soap, please leave a comment below with the scents that sound most exciting to you! (If you win we’ll let you review those selections before finalizing.) No obligation to share this post to enter, unless you wish to spread the fun to your friends. But please consider following Farmhouse Soaps’ Instagram or Facebook page to stay current with new scents as they are released. I was given three bars of Farmhouse Soaps as a lure to tempt me into advertising. I bit like a shark. All facts are courtesy of the soapmaker herself, and all opinions are entirely my own. This giveaway will remain open for one week, closing at midnight on September 10. Two winners will be chosen by random.org, contacted privately by me, and announced on this blog on September 11, if the Lord wills. Both of the Mrs. Zooks wish you well! This is exciting! Since I’m from Canada, I doubt I’ll be entered but I figured I had to share my favourite-sounding scents anyway!! Sweater weather has to be one cause that’s my favourite time of the year and Love Spell is the second cause that just sounds romantic and I can just imagine how good I would feel in such a scent?!! Yes! They will ship to Canada! ? I would have to pick love spell- it sounds so romantic. I’d love to see how it smells. ? My 2nd pick would be marshmallow fireside- it sounds so cozy and “fall-ish”. So many sound good! But if I was picking I’d choose Almond Biscotti or Fig and Brown Sugar. And not even sure what Muscadine is so will look that one up! oh how to make a choice!! But Vermont Honey and Apple sound amazing! Love Spell sounds charming! Also, Peach Bellini, sounds very Delicious. ..
A few I’d love to try are almond biscotti, neroli and shea blossom, and blue man. It’s hard for me to think pumpkin and soap in the same sentence, but I smelled it, in real life, and it’s amazing! I vote soufflé. Oh, and coffee with exfoliation, of course! Since Chai tea is my favorite drink, I can’t help but imagine that it would be awesome in soap!! Also crisp Anjou pear sounds very delicious smelling. Mmmm…..they all sound appealing!…..I think I’ll go with MapleToddy, Almond Biscotti, and Oatmeal Milk n Honey. I was just wistfully scrolling through her Facebook post! The pear, apple, and coffee ones currently tempt me the most. Fig and brown sugar and the Vermont honey and apple both sound like soaps I would love to try. I have tried her moonlit path (or maybe its moonlight,romantic sounding either way) and its lovely. I’d like to try the chai tea but I’m afraid I might try to drink the bath water after it so maybe I should go with sweater weather! How do you pick?! I’d have to say Crisp Anjou Pear caught my interest first, Neroli and Shea Blossom and the Maple Toddy. However, the cranberry orange sounds great too! I’m from Canada as well… but sweater weather and crisp anjou pear…. and of course the coffee one!☺ because autumn is my favorite time of the year. And coffee is my favorite drink. The Chai tea and pumpkin souffle sound amazing! Oh absolutely Love Spell and Blue Man, though a runner-up, would be Neroli and Shea Blossom. The herb garden sounds amazing also! I am absolutely in love with handmade soaps as my friend has been making them for years and they are THE BEST!!!! Do you wind up smelling like the soap? Or does it only last while bathing? Love Spell (sounds like it would be great for a marriage), Chai tea and Coffee (two of my favorite drinks), and Charcoal facial (because I’m a health nut)are the scents that tempt me. Happy giving! I would think the fragrance would stick similar to other soaps. I would say the coffee and Crisp Pear sound interesting. Oatmeal Milk & Honey and the Coffee one are ones that jumped out at me first but it’d be fun to try them all!!! Such dreamy names! I think I’d have to order them all just to get to smell them 🙂 but top choices would be Love Spell, Neroli and Shea Blossom, and Sunny Herb Garden… I think. Beautiful soaps! The scents that I’d like to try are Grapefruit Mangosteen, Alpine Frost, Peach Bellini, Fig and Brown Sugar. Crisp Anjou Pear and Coffee w/ exfoliation are a couple scents I’d love to win! Homemade soaps are my favorite! Wow, so many wonderful-sounding scents to choose from, and the soaps & wrappers are very attractive! I would pick pear, peach, Muscadine, Love Spell, and honey & apple. Yes please! Love Spell and Maple Toddy! The soap looks beautiful too. Sunny herb garden, love spell, and the charcoal facial sound really neat. Oatmeal milk and honey appeal as well. Such a fun giveaway! I’d love to try the sunny herb garden and love spell. The charcoal facial sounds appealing to me as well. Love Spell, Sweater Weather and the Coffee. Love coffee scents! I’d love be to try Neroli and Shea blossom, Blue Man, and Brown sugar and Fig!! ? They all sound delightful! Almond biscotti, oatmeal milk and honey, & chai tea are my top choices. I enjoy your blog alot! The love spell has been cast on nearly everyone, but I’d like to try it too! Along with coffee w/ exfoliation and oatmeal milk and honey. 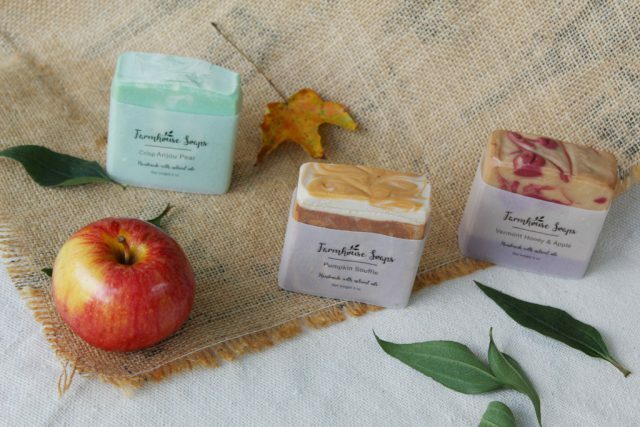 Vermont Honey and Apple, Oatmeal Milk and Honey, and Crisp Anjou Pear all sound wonderful! Thanks for doing this! Homemade soap sounds wonderful! The scents all sound good. I would like to try the coffee and maybe apple and of course love spell because it sounds romantic. Fig and Brown Sugar sounds good enough to eat. Blue Man makes me curious. Kentucky Bourbon isn’t necessarily something I’d like to bathe in, but I’m curious how that one is scented and what prompted the flavor. ? Kentucky Bourbon was recommended to me by a friend. It is an earthy, spicy fragrance. There is some similarities to Blue Man, but KB is a bit bolder and definitely spicier! I ❤ it! Truly FALL is my favorite! So I would enjoy the Pumpkin Scouffle and the Apple Jack peel. However it’s a toss up ..I love the smell of coffee also ! Very beautiful! Peach Bellini and Vermont Honey and Apple sound lovely! Anything apple makes me happy but so does sweater weather! But mostly it would make me happy to use soap that Wendy had a hand in creating. How I’d love to see that girl again! I can give you directions to my house. ? I would love to see you again too. Peach Bellini, Coffee with exfoliation sound wonderful! :) I love homemade soap! That’s so sweet of you Shari to do a give away! Thank you. Almond Biscotti and Apple Jack Peel sound pretty good to me. Maple Toddy, Love Spell, Blue Man. 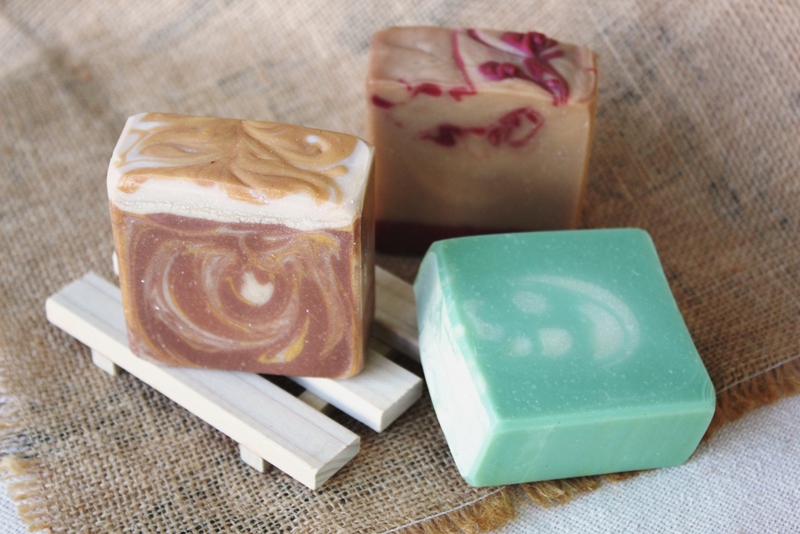 It’s always fun to check out a new homemade soap business. Thanks for introducing us to this one. I’d go with one of the Apple scents, I believe! What lovely colors of soap, they look too pretty to use. I would pick neroli and Shea blossom, Vermont honey and apple, and love spell. Oatmeal milk and honey, and pumpkin soufflé sound amazing! Love Spell and Blue Man sound lovely to me. Also the Charcoal Facial would be a taker for me! I know for a fact that Blue Man, Chai Tea, and Kentucky Bourbon are scrumptious; but I’d like a sniff of the Pumpkin Souffle and the currently curing Marshmallow Fireside. Go Wendy!!! Ohhh this makes me laugh! I didn’t know you taught her! She does beautiful work and must be a credit to you. Thanks for saying hi. Peach Bellini, sunny herb garden,Maple toddy sound nice to me. I have been a lucky recipient of Wendy’s soaps, and they are truly lovely. They suds up so nicely and leave my hands feeling soft. I think I’d like to try chai tea or blue man. Homemade soaps! It is rather hard to choose but I’d love to try Vermont Honey Apple, Oatmeal Milk & Honey, Sunny Herb Garden. Thanks for doing this drawing. Blessings on the soap making! Ohhh, Grapefruit Mangosteen and Sunny Herb Garden definitely caught my eye. Am I the only one totally flummoxed by what Blue Man might smell like? I was a little surprised to see nothing obviously minty, that – or grapefruit – are generally my go-to favorite soap scents. I had had a Eucalyptus Mint, but it all sold before I could get any listed. It will return! ? New visitor here. I came by from another blog because I liked the name of the site. 🙂 I would love to try fig and honey. Sunny herb garden, neroli and shea blossom, love spell and sweater weather…oh and of course coffee!! Muscadine and pumpkin souffle sound divine! Wendy lives close to me, but I didn’t know about her soap making until I read your blog. I would vote Alpine Frost, Almond Biscotti, or Neroli and Shea Blossom, but I’m sure many others are excellent as well. I’ve tried soapmaking though I’ve only tried a very basic recipe so far. I would love to try Chai Tea or Blue Man! Also I’m from Canada. What a sweet giveaway! Congratulations ahead of time to the lady who wins:) I think muscadine is a kind of wild grape – sounds lovely . . . I think the neroli and shea blossom and the brown sugar and fig also sound really nice. I love a Maple Toddy scent! Pumpkin Soufflé, Kentucky Bourbon, and Coffee with exfoliation sound delicious too. 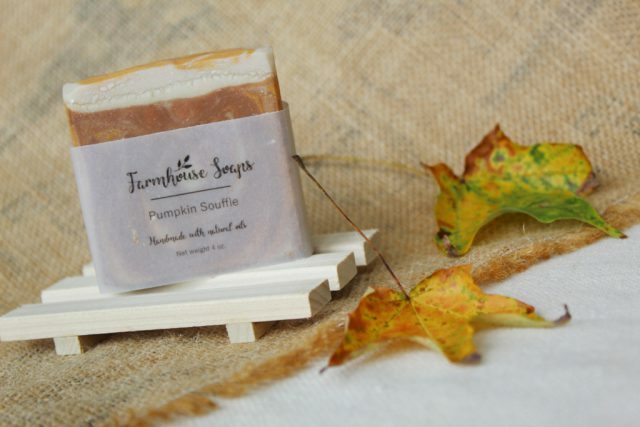 Coffee and sweater weather…I like the names and the soaps are lovely! Peach Bellini, coffee with exfoliation and Vermont honey and apple would be ones I would love to try although they all sound good! I would choose Sweater Weather and Apple Jack Peel because the names are cool. And Vermont Honey and Apple because it looks so pretty! All the names are capitivating, but Neroli and Shea Blossom, Love Spell, and Almond Biscotti really draw me in. Honey Apple and Cranberry Orange sound delightful! Sweater weather and pumpkin soufflé are my choices. The names are lovely and the pictures are beautiful; can’t imagine how tempting it would be to be able to SMELL the soaps yet! Can a Canadian reader enter?? if not, that’s ok…. 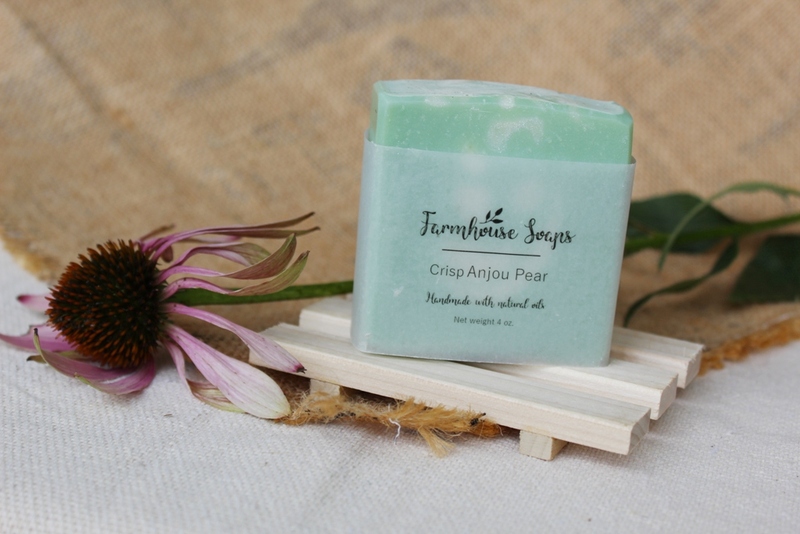 sweater weather, crisp Anjou pear, n sunny herb garden…. unless the winter flavours r up for grabs too? I am happy to include the winter ones, you will just have to wait until the end of Sept. or beginning of Oct. until they are ready. Crisp Anjou Pear, Peach Bellini, and Vermont Honey & Apple. I am recently very interested in what I put on my and my family’s skin, and am horrified at what garbage is put into “normal ” soaps sold in department stores. These sound absolutely delightful! Oh, yes, Wendy! Way to go! . . . They look so amazing! And you, Wendy, are an amazing lady! sweater weather, love spell and chai tea would be my choices. Love spell and peach bellini sound like such appealing smells! Peach Bellini would be my choice! Crisp Anjou Pear, Peach Bellini, and Vermont Honey & Apple. Oatmeal milk and honey and Chai tea sound attractive. Also the coffee one. Hey Jeanie, yes it is me. ? Thanks! Muscadine is a grape-y scent. I also have “Sun Drenched Vineyard on my curing rack. Vermont Honey and Apple, Peach Bellini, and Crisp Anjou Pear ~ A lovely selection! Hard choice! I’ve changed my mind a dozen times and I’m sure it would be more if I could sniff them… Let’s say Love Spell, Apple Jack Peel, Blue Man, Kentucky Bourbon, the Chai Tea one. .. see what I mean?? Oh man! They all sound great! I would try the blue man for my hubby and the sunny herb garden or apple jack peel for me. Coffee with exfoliation and chai tea sound incredible. Fingers crossed I win ? Muscadine and Vermont Apple and Honey ? So many flavors sound amazing! I’d love to try Vermont Apple and Honey and Love Spell – plus maybe all the rest of them too! So hard to pick! I think her soaps are some of the prettiest ones out there! Would love to try them. The coffee one and maybe the Vermont apple one look amazing along with a bunch of others! I am currently using her Blushing Orchid scent and it is wonderful! I would love to try Sweater Weather and Sunny Herb Garden. Gotta try this… I’m happy to claim the soapmaker as my neice! I think sweater weather, love spell and sunny herb garden sound worth trying! (Notice I went for 3… Don’t mean to be greedy, but just in case)? Anything with coffee is a plus. Also the neroli and blossom, blue man or charcoal one would be fun to try for its health benefits. Thanks for this fun give away. I love reading your posts. I didn’t know Wendy was making soap, but I’m not a bit surprised 😉 I would love to try the Apple Jack Peel or the Pumpkin Souffle. O! How would I choose?!! They all sound amazing. But coffee would have to be one of my first choices ? pumpkin soufflé, cranberry orange and grapefruit tempt me also. Eww…lovely…I love fall so Pumpkin Souffle. Love Spell and Crisp Anjou Pear sound great too! Would love to win! 🙂 Beautiful soaps! Way to go, Wendy! Sweater weather or Love spell — but how would I really know unless I sniffed them personally?! Which sounds most exciting?! Peach Bellini? Pear? Mango? Almond biscotti? (Could it smell as good as it tastes) chia tea? Anything pumpkin? Oh my!! Any and all! I’d have a hard decision! Many Sound great!! How to choose?! Wendy is an expert at name choosing. 🙂 I think Vermont Honey and Apple, Coffee with exfoliation and Fig and Brown Sugar are at the top of my fall choices, but I want to smell them all! I would love to take credit for the names, but I just use the name of the fragrance oils. ? Pumkin Souffle , Coffee , Love Spell…. I would like to try the Crisp Anjou Pear, the Fig and Brown Sugar, and the Oatmeal Milk, and Honey. These soaps are absolutely beautiful. I had no idea it was Wendy though, (not that she knows who I am), 🙂 The coffee scent sounds fabulous. Coffee and love spell sound amazeing!! Crisp Anjou Pear, Love Spell, Coffee with exfoliation. Honey Apple and Anjou Pear both sound delicious! I love the scent names- they all give a word picture to me! I choose Vermont honey and apple, charcoal facial, and since I love my flower gardens, Sunny herb garden! I want to go down the line and sniff them all! My choices would be crisp anjou pear, fig and brown sugar, and almond biscotti. Me! ? 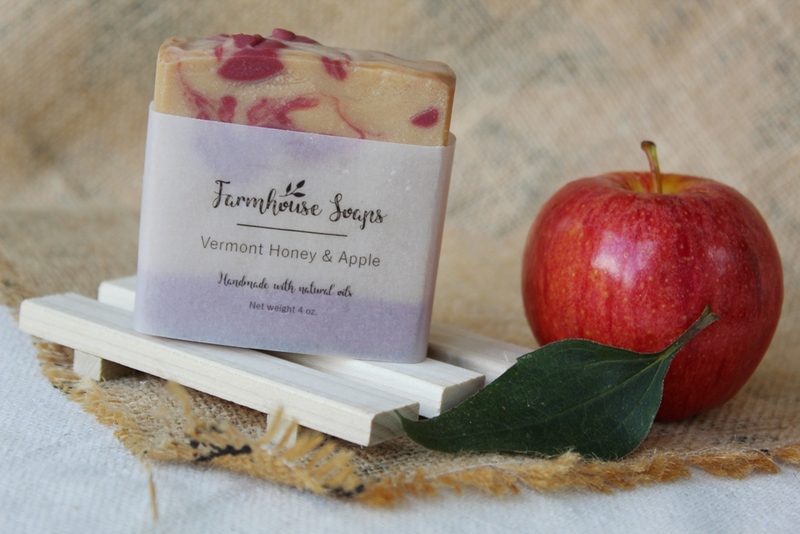 Vermont honey and apple, sunny herb garden, sweater weather sound lovely! Love spell, Chai tea, and Vermont Honey and Apple sound exciting to me. The ones I would most like to try would be pumpkin soufflé, chai tea, and sunny herb garden. I would love to try love spell, almond biscotti, and apple jack peel! Seriously? How am I to pick? They all sound delightful. The grapefruit mangosteen, love spell, the pumpkin, coffee, apple! All of them!!! ? I would love to try the sweater weather and blue man scents…. Wendi, I think what you are doing is so cool!!? I would like to try Muscadine or Sweater Weather!! They all look interesting!! Peach Bellini, and Apple Jack Peel. I love fruity scents! Sweater weather and Sunny Herb Garden sound interesting! I’m leery of things that look and smell like food, but are not food. Some of the little folks in my house might actually eat it! Or I might eat it myself on some of my most sleep-deprived days. 🙂 Therefore, if I was choosing a soap, I would go for Sweater Weather and Charcoal Facial. They both sound great. Ah, can’t wait for sweater weather again. I am so tired of hot dry days. And then if I could have some magical charcoal soap to erase all the imperfections from my face, life would be wonderful! Such lovely names; chai tea, sweater weather, and love spell are the ones I’d like to try first! The soaps sound amazing, the ones that caught my eye is Love Spell and sweater weather. I’d love to try Crisp Anjou Pear, Sunny Herb Garden, and Sweater Weather. The soaps look beautiful! Sweater Weather, Kentucky Bourbon, Love Spell, Charcoal Facial…. and so on and on:) What lovely creations. Any special words can I say to up my slim chance of winning? Love spell, sweater weather, neroli and shea blossom would be fun to try. I would love the peach Bellini, Crisp Anjou pear, and apple jack peel. Any type of fruit scent is lovely.I have allergies that act up with a lot of the floral scents, so go the fruits and also coffee. Thanks for the fun and lovely smelling give away. Would love to try sweater weather, marshmellow fireside, kentucky bourbon and charcoal facial to name a few. Maple Toddy and Chai Tea sound luscious! Oatmeal milk and honey. Fig and brown sugar. Crisp Anjou Pear, Love spell, and Shea blossom sound amazing! What hard decisions! I really like homemade soaps! Almond biscotti probably smells heavenly as well as the pumpkin soufflé and the fig with brown sugar! Hope I win some!! Anjou Pear sounds lovely for Fall as do many of the others! 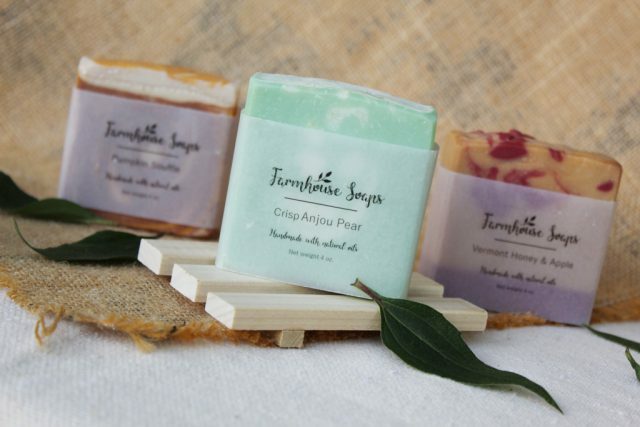 Anjou pear, sunny herb garden, and peach bellani all sound like they would smell delicious! Maple toddy and love spell…. gorgeous soaps!!! Maple Toddy and Fig & Brown Sugar sound divine! Pumpkin souffle and chai tea or maybe sunny herb garden or maybe all of them? Love Spell, Coffee with exfoliation and charcoal facial would be my top picks! They sound good enough to eat! I would love to try the Neroli and Shea blossom, the Love Spell, and the Coffee with exfoliation. I love my coffee ☕️ ? Maple Toddy and Oatmeal Milk & Honey. These lovely names are inadvertent testaments to our love of food— interesting, isn’t it, since we’re talking soap? Fig and Brown Sugar sounds nice, as does the Anjou Pear. Hard to decide, though, since they all sound wonderful! Amazing!! I would like to try the love spell, coffee and apple jack!! I’m thinking “love spell”, “sweater weather”, and”chai tea”. Giveaways are so much fun!